The Movement for Black Lives hopes to increase voter turnout among African-Americans across the country by texting "WAKANDA" to 91990. Civil rights activists are tapping into the success of the "Black Panther" film to encourage blacks and other minorities to register to vote before the 2018 midterm elections. #Wakandathevote is a national campaign created by the Movement for Black Lives, a coalition of more than 50 organizations around the country dedicated to social activism. The campaign was organized by Rukia Lumumba, Jessica Byrd and St. Louis activist Kayla Reed. The campaign gets its name from Wakanda, the fictional nation that is the setting for the film. 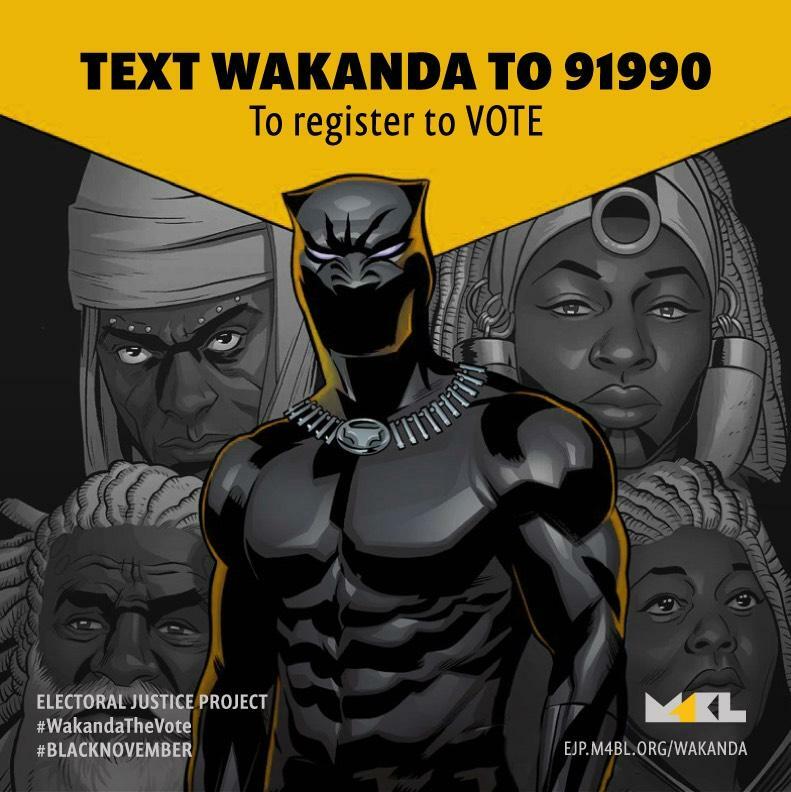 It encourages people interested in registering to vote to text “WAKANDA” to the number 91990. After sending texts, potential voters will be asked for their zip codes and are presented with a form to begin the voter registration process. “We couldn’t miss it as an opportunity to really talk to folks about what it would be like to build, to be change agents like Black Panther in our own communities and to fend against attacks, and what it would look like to uplift people who are change-makers in our own communities,” Reed said. The Movement for Black Lives chose “Black Panther” to start their voting initiative because of the popular film’s stance on black pride. The film has broken box-office records for the biggest Presidents' Day opening in history. Reed notes that black voter turnout was critical in several special elections over the last few months, especially in the 2017 U.S. Senate contest in Alabama, where black voters made up 29 percent of the electorate and helped Democrat Doug Jones defeat Republican Roy Moore. She said the project's goal is to motivate blacks and other minorities to stay engaged with politics after the midterm elections. The campaign has registered more than 1,000 voters nationwide. The Movement for Black Lives is also using #Wakandathevote to set up voter registration drives in communities. People interested in creating registration drives can text the word “PANTHER” to the number 91990. Since the effort started, 100 voter registration drives have launched through the campaign. “Black people vote and we continue to vote and we’re going to show up, because it matters to our communities,” Reed said. The #Wakandathevote campaign will continue for the duration that the film is out. The Movement for Black Lives will also start a similar campaign that will be tied to the film “A Wrinkle in Time,” to be released this March. Welcome to Wakanda, the technologically advanced fictional nation that is the setting for an upcoming superhero, blockbuster film. If you are not sure where that is, try asking the thousands of people who pre-ordered tickets to “Black Panther,” the film with the most first-day presales in history.